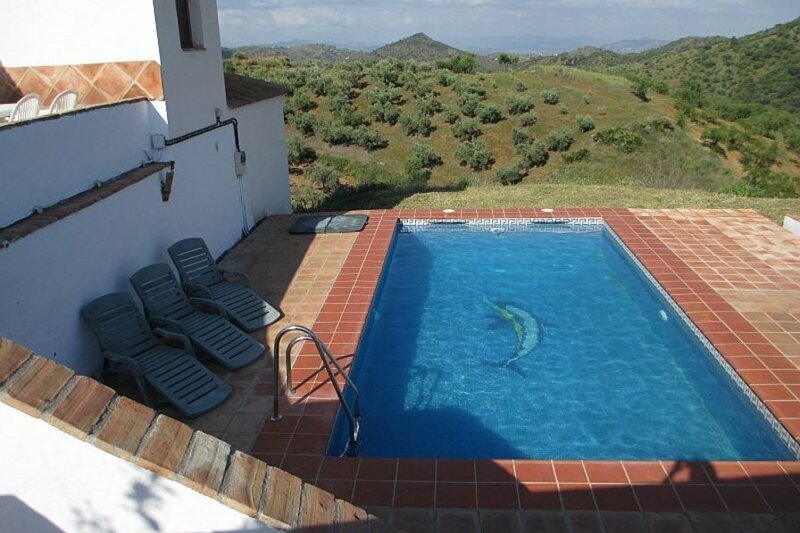 Beautiful Spanish style country Villa with stunning views to mountains, private pool, easy access to Malaga Marbella & coast with airport meet and greet by owners, plus guided tours of the area. This is a beautiful Spanish style country villa, and unlike other villas in Spain, we meet you at the airport and bring you to the house with your rental car. We then show you around the house until you are settled in with minimum fuss, so your holiday can start as soon as you step off of the plane at Malaga airport. No need to worry about getting lost, or stressing out to get to the villa, as we will be there to meet you. The Villa is fully appointed with a lovely spacious kitchen, huge American fridge, 5 burner stove with 2 ovens. The top oven is perfect for pizzas (quick meals for the kids) and the bottom oven is large enough for a large meal for the whole family. dishwasher; washing machine; kettle, toaster and microwave, in addition to all cutlery plates cups saucers glasses etc. everything is there for your holiday. The summer terrace is perfect for BBQ's ( this is where our huge BBQ is kept) as this terrace gets the hot sunshine in the morning but is lovely and shady by early afternoon. this terrace also has the stunning views across the mountains. The winter terrace catches the sun all day long, and overlooks the pool area. The pool area has a large sunbathing terrace surrounding it. This area is very private and can not be looked over by any other properties. We have spectacular views towards the village of Guaro in one direction, and towards Malaga and the Sierra's in the other direction.There are sunbeds and sun lounge chairs on the pool terrace and sunbathing area. The pool is 8 meters long, and 4 meters wide and is an absolute dream of a pool, you will love it, especially the kids!! From the top floor you take a beautifully tiled Spanish style staircase to the lower bedroom floor, where you will find 3 large bedrooms (4 meters by 4 meters) that's about 12 feet by 12 feet, which are very comfortably appointed with good beds and clean fresh bed linen and towels (yes we supply towels so don't pack any). The master bedroom has its own en-suite bathroom, with a huge bath and shower over, toilet and lovely Spanish style drop-in sink with 2 mirrors above. there is a King size bed in this room with plenty of wardrobe and draw space, and a ceiling fan above the bed. Bedroom 2 is the same size, but has 2 single and very comfortable beds, with a huge ceiling fan over head. This bedroom uses the central bathroom which has a big shower recess, toilet and lovely modern sink over a big storage cupboard, with plenty of room. Bedroom 3 has a king size bed, once again with a ceiling fan over the beds. Bedroom 3 has its own ensuite bathroom. Everyday gets a fantastic summer breeze that blows through the top floor when the summer terrace french doors and the winter terrace french doors are left open. This is very cooling in the heat of the day, and is much much healthier than air conditioning. The bedrooms on the lower floor are in the shade for all of the afternoon, as the house was built into the hill to keep the lower floors cool, and with ceiling fans they are pleasant to sleep in. We are in one of the most beautiful parts of Spain, with historic dams and hydro electric power systems which were built before and during world war 2. The film "Von Ryans Express" starring Frank Sinatra was filmed just up the road. We are in easy reach of Gibraltar and the ferry boats to Morocco and Ceuta leading into North Africa. This whole area is stooped in history, and there are many Roman sites to visit.